This post originally appeared on the HubSpot Marketing Blog. I have an admission to make. I’m a revenue (sales) guy. I can think about, conceive and vision growth opportunities without even trying. On the other hand, thinking about (and understanding) costs doesn’t come so easily to me. I’ve learned that understanding your costs is crucial to creating profitable revenue consistently, sustainably and scalably. Unfortunately, very few small and mid-sized companies understand their sales cost structure well enough. If your costs are too high, you’ll struggle to grow profitably and your very sustainability will be threatened. If your costs are too low, you may very well struggle to gain the momentum and velocity you need to break through the noise, separate yourself from your competition and achieve your sales growth goals. 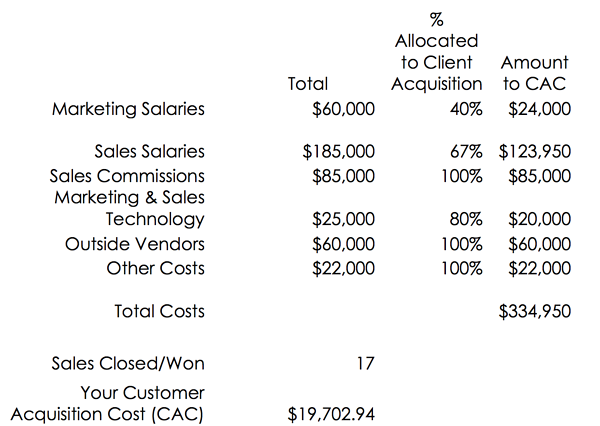 An important metric to understand is customer acquisition cost (CAC). While this metric is very common with SaaS companies, my experience is that it doesn’t get the attention it deserves in other industries. It’s important that you understand your CAC, the contributors to CAC and the model you’re implementing to manage it. With a clear understanding, you can ensure that you are investing wisely in growth. A lack of understanding makes it impossible to determine the effectiveness of your sales and marketing efforts. In this post, I outline the process we recommend for building your sales cost model and how to monitor its effectiveness and the effectiveness of your sales and marketing investments. Determining your customer acquisition cost is a relatively simple calculation. You calculate it by dividing the total costs associated with generating new customers by the number of new customers you gained in a specific period of time. When determining your costs, only include the costs associated with getting new customers. Do not include the costs of retaining or servicing them. If you’ve got salespeople who have responsibilities for both, you must prorate those expenses according to how they spend their time. The same is true for any technology or other sales and marketing overhead. In this case, it cost this company just under $20,000 to acquire each of their 17 new customers. But, here’s the unanswered question: is that good or bad? Did this company spend too much to get their customers, or could they have benefitted from investing more? To answer that question, you need to determine what your target CAC% is. Calculating target CAC% is done by dividing your CAC by the average lifetime value of a customer. Average lifetime value simply measures how much money a customer contributes to your business over the lifetime that they are with you. To determine lifetime value, we recommend using a variation of gross profit in the calculation. The variation is determined by taking the value of the sale and reducing it to only the non-sales, direct costs of what is being sold. Let’s go back to our example. In this case, our sample manufacturing/distribution company earns an average gross profit of $24,000 per customer per year, and their average customer lifetime is 3.5 years. So the lifetime value of the typical customer is $84,000 and the CAC% is 23.5% (calculated by dividing their CAC (19,702.94) by their average lifetime value ($84,000)). The next step in the process varies depending on several factors, such as the type of business you’re in, your revenue model and how aggressively you’re growing. Most sales and marketing benchmarks recommend that CAC be targeted between 20% and 35% for growth businesses. As a side note, if you’re a very young business you should often go above these norms. Given the nature of their business, our sample company is in a reasonable range. However, one could make the argument that if they invested more in customer acquisition, they’d be able to grow faster and more profitably. The next step in this process will determine whether that argument can be won. One of the most common mistakes I see companies making that aren’t growing at the sustained rate they desire is they’re not allocating enough resources towards the top and middle of the funnel (the lead generation and lead management functions). Lead Acquisition Costs Percentage – what percentage of your customer acquisition costs are allocated to create sales qualified leads (SQL). Sales Acquisition Costs Percentage – what percentage of your customer acquisition costs are allocated to support the new-sales process. Let’s go back to our sample manufacturing/distribution company and see how it stands up. 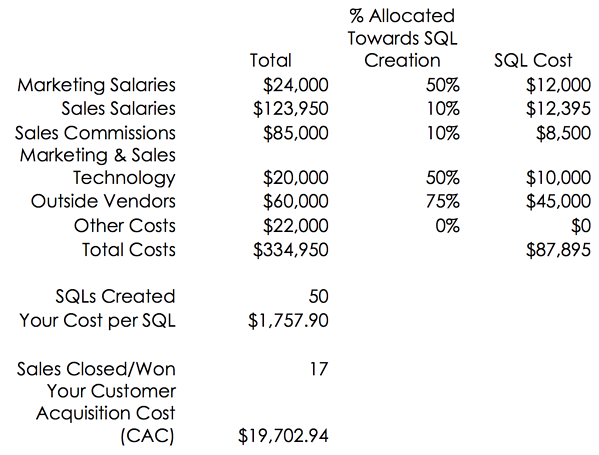 By using the same numbers as we did to determine the overall CAC but changing the % allocated column to reflect the percentage of costs that go towards creating an SQL, we can determine the cost per SQL. Now we’re quickly able to see that less than 10% of their acquisition costs are geared to support lead generation, and more than 90% go to supporting the actual sales process. This is a formula for stagnation. Knowing the company that this data is based upon, they’re challenged because they feel that their sales team is at capacity and they’re still not getting the growth results they want. They would be far better off allocating more money toward the top and middle of the funnel to create more sales qualified leads and/or to improve the quality and readiness of those leads when they get into the hands of the sales team. How complex is your sale? The more complex the sale, the more you’ll want to allocate towards the sales process, and therefore be on the lower end of the scale. Don’t make the mistake, however, of under-allocating resources towards lead generation, nurturing and conversion. What’s the value of the sale? A higher value sale will often allocate more towards the sales process and a smaller percent towards lead management. Do you have a defined sales development team? If you don’t, you should consider one. This would put you towards the middle or even upper band of the lead cost percentage continuum. How much of the sale do you want done before it gets in the hands of a salesperson? A growing trend in the world is empowering the customer to do more of the sale on their own so that when they get to your new-sales team, they’re better educated and ready. This would mean you’d allocate more of your CAC towards lead management. When more money is allocated towards lead generation and management, your sales process becomes much more efficient and effective. You’re able to increase the volume and velocity of your lead generation, thus enabling you to increase the average sale value and your closing ratio. Research shows that companies that manage leads well enjoy 50% more sales ready leads (Forrester Research) that make 48% larger purchases (The Annuitas Group). Up to this point I’ve been highlighting how to calculate and use this data when looking at the results of your efforts. This data is equally important when planning for the future. Determining what you can and should invest in each part of the revenue generation process is valuable when determining the tactics you will use, how you will implement them and how you’ll track your progress. We call these numbers your target costs. 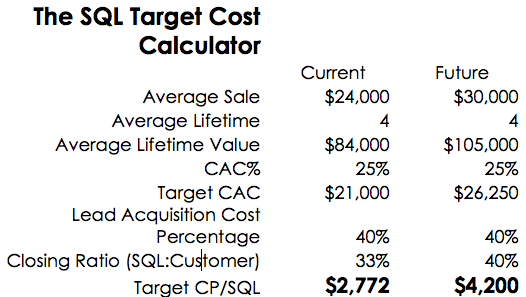 To determine this we created The SQL Target Cost Calculator. Now let’s go back to our manufacturing/distribution company and figure out how much they should be allocating towards creating SQLs (for where they are now and what they should do to drive better results). Over time, as you improve and enhance your process you’ll see that your sales costs, and even acquisition costs, will decrease. While this is a strong indication of an effective process, don’t make the mistake of under-allocating resources as you may kill the very momentum you worked so hard to create.